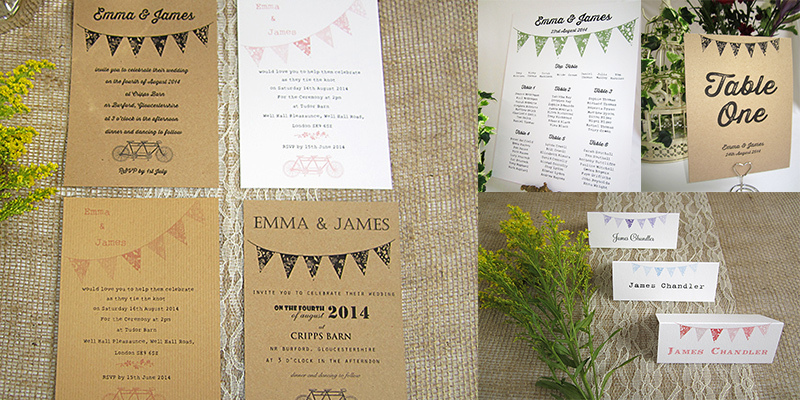 The 'Summer Bunting' stationery is perfect for a village fete or rustic, country wedding theme! With a pretty bunting motif and incorporating other vintage motifs and fonts, we can make the perfect rustic bunting stationery suite for your wedding. The invitation is available in many different fonts and layouts and the bunting can be printed in any colour. Card as available in 300gsm smooth or laid card in white or cream. It can also be printed on eco kraft or ribbed kraft card for that country, rustic effect. If you would like to bundle the invitation, guest card and RSVP together, we can tie the invitaton 'stack' in rustic twine and finish with a personalised bunting tag. Order of service, seatng plans, menus, place cards, table names are all available. Perfect for a wedding tea party! . Copyright © 2009-2013 Wedding Invitation Shop. All rights reserved.